Are you in the market for a kayak? Whether you enjoy water sports or outdoor activities, kayaking is a great way to enjoy both. While there are many different ways you can use a kayak, on the ocean, rivers, lakes, and white water, this makes the buying process seem exceptionally intimidating. The kayak market is extremely diverse, offering a plethora of options for adventurists and outdoorsy people to choose from. Before you start out your search to buy one, it’s important to understand the different types of kayaks that are available to you. If you don’t get the right one it will not work properly in specific situations, and could potentially be detrimental. What many buyers don’t understand is that kayaks are designed for particular intended uses. Understandings the types of kayaks that are best used for specific types of water or activities will help aid you in finding the best one for you. Explore all the types of kayaks below! Creek boats are what you could consider the typical kayak. It is generally used by everyone, whether you’re a beginner or an advanced kayaker. In fact, the creek boat is specifically meant for faster and quicker turns, making it ideal for rivers and creeks, but it can be paddled almost anywhere. A creek boat is a high-volume kayak, with an equal volume around the cockpit. The design of this boat ensures that the boat will be less likely to submerge and even if it does, it will resurface instantly. You will find that these boats have stubby or slightly rounded tips, and edges along the bottom that helps to control the boat on tight turns. When shopping for a more versatile kayak, the creek boat is the way to go. While the creek boat isn’t the longest kayak in the family, it certainly isn’t as small as play boats. Have you ever heard of surfing waves in a kayak? The play boats are made specifically for surfing waves, performing tricks, and holes. If you’re into intense water sports, then this is the boat for you! The shape of this boat is somewhat like a banana. Its shape is made intricately, so it performs well for high-performance water sports. The squashed decks are meant for the paddler to perform play moves. The center of the play boat has a lot of volume to ensure stability while playing in this vertical realm. However, it’s important to remember if you aren’t looking for surfing waves or performing tricks, the play boat is unsuitable for any other type of kayaking such as river-running or a relaxing paddle. 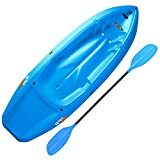 This unique kayak is extremely versatile, with a perfect mix of the play boat and the creek boat. This boat falls right between high-volume and low-volume, offering paddlers a controlled cruise down a river as well as some basic play features. The downriver boat has pointy tips that are made to shed water, allowing you to have comfort and control during your paddling. Out of all the kayaks on the market, this one is longer than most, which means it can move along much faster on a straight course. If you are looking to kayak down a large lake, river, or the bay, the down river boat is your best choice. 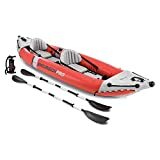 It is also perfect for beginners, and those who like to kayak long distance because this boat will travel much faster at a more controlled path. Check out our review of the Sun Dolphin Aruba 10 Kayak, this is a great beginners kayak. 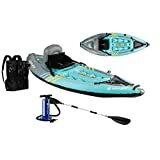 A great one for the family is the Crystal Explorer Clear Kayak, this will give you such a great experience and be able to see under the water! A sit on top kayak is just as it sounds. These kayaks simply have no cockpit. The paddler sits down on a plastic shaped seat and stretches their legs down the front of the boat. Everything is exposed in this situation, offering you a chance to get a nice tan while you’re at it. An example of this type of kayak is the Aruba Journey 12. The sit on top kayak is the most commonly used boat out of the entire kayak family. Just like the creek boat, this boat is easy to maneuver and exceptionally quick. If you ever rent a kayak from a rental shop, these are the boats you are likely to receive. They are more affordable and easier for beginners to use. If you are planning on going white water paddling, kayak surfing, or on any type of advanced course, this boat is not for you! The sit on top kayak makes a great fishing kayak or for sight seeing, and cruising. During your kayak shopping adventure, you may run into inflatable kayaks, such as the Intex Challenger K1 or Intex Explorer K2 Kayak. If you want something portable and easy to travel with, these kayaks are exactly what you need. They are great for compact storage and transport if you don’t have a vehicle that can easily transport regular plastic kayaks. The inflatable boat is only meant for the recreational use of paddling on flat water. Many families love this type of boat because it is easy to pack and inflate, and it is also very stable, fitting about 2-3 people on a boat. Many individuals don’t fully understand the difference between the types of kayaks used for white water and the sea. Some think they can buy a sea kayak and use it on white water because they look similar or they both can take high-impact. They’re wrong! Each of these boats is fundamentally different and uniquely designed for certain circumstances that do not relate. White water kayaks are meant for absolute maneuverability, and sea kayaks are all about stability and speed. A white water kayak has rounded hulls to make rolling easier, ensuring the kayak has an easier contact with the water. They are also slightly shorter in length and have minimal chines. These designs are meant for the paddler to have less contact with the water, which makes it easier to maneuver through the aggressive and fast flowing power of the white waters. The sea kayak’s design takes a whole different approach, aiming for an opposite goal. These boats are designed with a flat hull to help increase stability for ocean wave action that pushes hard to knock the boat off balance. Their hard and long chines are made so the boat is much faster, rather than maneuverable like the white water boat. The sea kayak is designed to give the paddler more distance per stroke, perfect for covering large distances like the ocean! While you may have an idea of the type of kayak you need, there are still many terms that you need to be familiar with when it comes to the different types of kayaks available. With there being many different types of kayaks, it also means there are a lot of different terms to learn. These terms are extremely important and they should be the foundation of your reasoning behind the kayak you choose! Without knowing the parts of what makes each kayak unique, you could end up buying the wrong type of boat. You need to know what your boat needs to meet your needs. Learning the below terms will help your search for the perfect kayak much easier. The volume is the inner capacity of the kayak, so when determining the style of kayaking you desire, the volume will determine which boat is best for you. High volume kayaks will have larger “balloon” shaped ends to help them resurface quicker. This volume is perfect for both beginners and advanced paddlers who are traveling through more difficult rapids. Low volume kayaks will have thinner decks and pointy points. These thinner boats allow paddlers to cut into the water more efficiently, making freestyle moves fun and easy. Low volume kayaks are not good for swirling currents or rocky routes. The hull is the shape of the bottom of a kayak. There are only two types of hulls: displacement and planning. The difference between the two is extremely simple to understand. The displacement hull is the most traditional bottom of a kayak. This bottom has a continuous curve and is smooth without any ridges. The planing hulls have a flat bottom with sides that come to a defined angle. The flat surface helps the boat increase in speed as if it’s skimming the water’s surface. These hulls are hard for moving in straight lines for long distances. A chine is the lining underneath the kayak, that joins the bottom and the sides. The chines define the shape of the hull, so it’s important to understand the chine to ensure you are choosing the right kayak for your activity. Hard chines offer much more pronounced sides to the kayak, providing an edge control so the boat can continue planing even when turned sideways or spinning. When choosing a hard chine, it demands attention and excellent technique, so it is not recommended for beginners. Soft chines deliver more forgiving rides for beginners, offering an edgeless ride. These boats have less edge with a smooth bottom that curves up to the edge of the boat. However, these boats offer less carving ability but a more predictable response when the boat comes in contact with shallow waters. You won’t have to worry about getting caught on rocks or shallow floors—a soft chine kayak will ride smoothly. The rocker is the curve underneath the kayak that leads the bow to the stern (front to back). They come in two styles: the kick rocker and the continuous rocker. Kick rockers offer a relatively flat bottom that is located in the center of the boat, and the ends make a sharp angle upwards. If you are looking for a play boat, you want to look for a boat with a kick rocker. A continuous rocker offers a continuous curve from the front of the boat to the back end. This curved bottom delivers quick turns and excellent maneuverability. A continuous rocker is perfect for rivers. Some kayaks come with small pegs for your feet to help maneuver a boat if you’re into tricks and advanced paddling. It’s also comfortable for your feet to push up on during a long paddle. Pegs are usually padded plates that are often made from foam blocks. Most kayaks offer adjustable pegs, allowing you to stretch out your legs as far as needed. In almost every modern-day kayak, there is not room for foot-pegs anymore. Instead, there are bulkheads, which provide a comfortable and stable area for the feet. It helps in times of impact, offering protection over your feet and ankles by minimizing the impact. When looking at a kayak, a bulkhead will look like a solid platform in the front of the boat where the feet would likely go. Thigh hooks are mainly for advanced paddlers looking to kayak down white water, or those looking to do tricks in a play boat. The hooks allow lower body movement, which helps maneuver the boat more efficiently. The hooks are to make the boat like an extension of the lower body. Some kayaks offer more advanced hooks that hold the paddler’s legs, and some offer less aggressive hooks for those who aren’t looking for a highly advanced boat. The pillar is the vertical wall inside the front and back the kayak’s cockpit. The pillar is what provides the structural strength of the boat. All the essentials you need to know about buying a kayak are listed above. From the different types of kayaks to their features, and important kayak terms, you are now a kayak know-it-all. Your next step would be to buy your first kayak knowing all the knowledge and essentials for making an excellent purchase. Happy kayaking! It is important to remember that you will need to get your kayak from your home, to wherever you will be using it. This is way you recommend look for the best kayak car roof rack or kayak trailer to suit your needs. Would like to know if a “sit in or on” kayak is better for an older person with some back problems. Also, is one or the other easier to get in or out of. Is one easier to tip? I would say for you a sit on would be best and easier to get in and out of.